To no small great degree, the 1980s were an ugly, depressing time when the secret to pop-culture success lay in congratulating the mass audience on its shallowness and taste for blatancy. Enough time has passed by now that there are actually people who feel some nostalgic affection for Top Gun and The Goonies, and Sylvester Stallone has somehow concocted an entire franchise out of the notion that there’s something old-school lovable about terrible, badly-made action movies in general and himself in particular, but these are lies, and most of what played in the multiplexes during the Reagan years could be safely pitched down the memory toilet and flushed away forever at no loss to anyone. As for the gallery art of the period—the actual art, art that is meant to provide a more exalted alternative to whatever scraps the groundlings are content to munch on—the most typically “80s” work of that time was created by the kind of people—your Schnabels, Basquiats, and Salles—who appear to be charlatans before you read their interviews and realizes that they’re sincere folks who just aren’t that talented or intelligent. Then there’s Pee-Wee’s Playhouse, a little half-hour Saturday morning children’s show that ran on CBS from 1986 to 1991, and which is the exception to both rules. The show, which has just been re-issued on Blu-ray in a “complete series” box from Shout! Factory, represented the apotheosis of a character who many people would safely assumed did not have an apotheosis in him. Paul Reubens started playing Pee-wee Herman, the perpetual bratty little boy in the body of a grown man stuffed into a tight-fitting gray suit, when he was doing improvisational comedy in the late 1970s, when he was in his mid-twenties. The character got his own stage show, which was filmed and broadcast on HBO in 1981, and went mainstream through a string of appearances on The David Letterman Show. The HBO version of The Pee-Wee Herman Show looks like a smug, midnight-entertainment goof on old kids’ shows, and Pee-wee would have likely remained a talk-show novelty act like Tiny Tim or Mrs. Miller if he hadn’t hooked up with Tim Burton, then reeling from an unhappy apprenticeship in the animation department at Disney, for the feature film Pee-wee’s Big Adventure. Burton and Reubens were able to devise a cartoonish live-action world where Pee-wee would at least be able to fit in well enough to count as a plausible outsider. The movie was a hit, and led to CBS offering Reubens a Saturday morning cartoon series based on his character. The network probably assumed that the character could be easily spun off into any number of adventures like the ones in the movie, where Pee-wee’s search for his stolen bike took him to such locales as the Alamo and beautiful downtown Burbank. In holding out for a live-action series, Reubens instead enlisted the talents of a great many artists and craftsmen to create a sanctuary for Pee-wee, a geek’s paradise (in a Claymation forest landscape) where he and his friends can get away from it all. The place was augmented by a green-faced genie (John Paragon) in a box, a pet pterodactyl, a talking clock (“Clockey”), a talking window (“Mr. Window”), a talking chair (“CHairry”), a talking globe (“Globey”), and, after somebody uncovered him in the second season by rearranging the furniture, a cute-grotesque talking section of the floor, “Floory.” There was also a puppet jazz trio and a family of pint-sized Claymation dinosaurs living in a mouse hole. 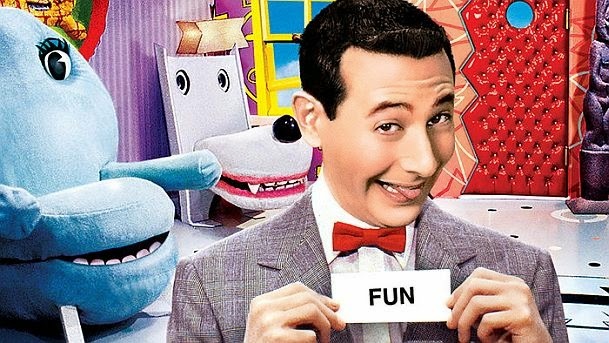 When not interacting with his friends, Pee-wee would turn to the camera to address the viewers, inviting them to play along with such games as screaming whenever someone on the show said the specially selected “word of the day.” Originally, the show was broadcast early enough in the day that inducing the kids to scream must have drawn the whole household into the drama going down onscreen. A CBS executive called upon to account for the stranger elements of the show would have likely explained that it was a kids’ show that made fun of kids’ shows. It’s a time-tested category that encompasses the minor Boomer hero Soupy Sales and Uncle Floyd, whose series on a New York UHS station made him a punkers’ mascot, as well as such lesser-known curios as the mid-‘70s series Uncle Croc’s Block, in which Charles Nelson Reilly, in a crocodile costume, got into arguments on-camera with his “director” (Jonathan Harris) about not being taken seriously as an artist. But if the original Pee-wee Herman Show was a snarky, mildly raunchy deconstruction job on “classic” ‘50s children’s TV, Pee-wee’s Playhouse is, for all its Downtown Pop Art set dressing, a genuinely good-hearted celebration of the creativity that’s fueled by play and a childlike imagination. Gary Panter, who also worked on The Pee-wee Herman Show, supervised the construction of the set; he reportedly spent the first fifteen minutes of the first day of production delegating orders to the workers under his command while reading scripts for the show and designing it all in his head. In the documentary Beauty Is Embarrassing, starring the painter and puppeteer Wayne White (who built and voiced several of the characters), described the workplace—a former sweatshop in a New York loft—as “a giant beehive of a room” where everyone was treating the show as a “Downtown New York art project.” Every episode included brief snippets of classic black and white animation—presented by the visiting “King of Cartoons”—from such directors as Dave Fleischer, Bob Clampett, and Ub Iwerks. This stuff couldn’t have looked less like the cheap, factory cartoons surrounding it on Saturday mornings, and that was the point; the show included just enough of it to intrigue kids and make them wonder about more eccentric aesthetic possibilities. 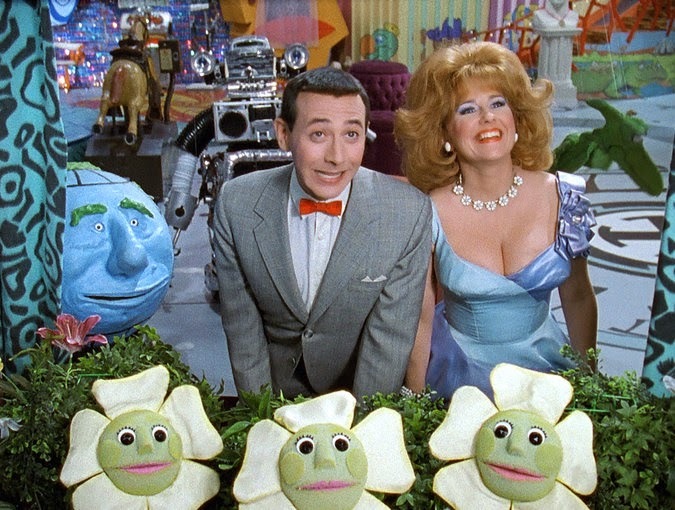 The many different kinds of design and visual styles thrown together in Pee-wee’s Playhouse might have been inspired by the children’s book writer Daniel Pinkwater’s explanation that he included short tributes to the likes of Laurel and Hardy in his novels such as The Snarkout Boys and the Avocado of Death, because it was part of his responsibility to his young readers to tip them off to where the good stuff was. The value of childlike creativity is one of those ready-made phrases that unimaginative, sanctimonious proponents of bland children’s entertainment are always ready to get behind, though they may be a little confused or dismayed by the real thing when they get a look at it. 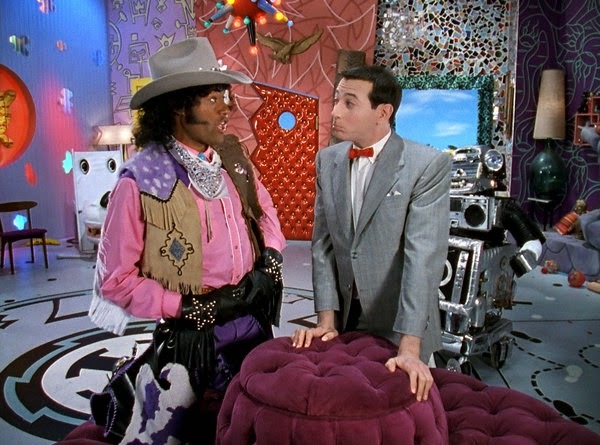 Pee-wee’s Playhouse was also, by design, morally instructive, but it didn’t instruct the way some of those kid’s TV concern trolls might have wished. The show has a neo-fifties vibe—as did Ronald Reagan, Footloose, and Blue Velvet, to name but a few ‘80s cultural touchstones. But the characters didn’t come from the same white bread loaf that usually goes with that vibe. It was quite the diverse, multi-culti cast: it included Phil Hartman as salty Captain Carl; Laurence Fishburne as Cowboy Curtis; Lynne Marie Stewart as the most beautiful woman in Puppetland, Miss Yvonne; the black actor Gilbert Lewis as the King of Cartoons; the young actress Johann Carlo as his herald; the trumpet-playing taxi driver Dixie; the cult character actress Shirley Stoler as Mrs. Steve; S, Epatha Merkerson in the Margaret Dumont role of Reba the Mail Lady; and Roland Rodriguez as Tito, the Playhouse lifeguard, who was always seen in a Speedo that showed off his boy-toy build. Pee-wee himself is often read as gay, though he seems more pre-sexual, albeit ambiguously so. (Sometimes he and Miss Yvonne seem to have a schoolyard crush on each other; at other times, he seems more like her BGF.) There’s never anything preachy about the show’s inclusiveness; it’s just a welcome corrective to the more familiar pop-culture mold in which the white, straight characters luxuriate in the relaxed pleasures of a ‘50s style while anyone else is presumed to be drinking from a segregated water fountain that’s kept out of camera range. After Phil Hartman left after the first season, the show lost its only overtly straight, white adult male presence, and this didn’t seem like a big deal, except that it was always better to have Phil Hartman around than not. Reubens decided to end the series with its fifth season; the last first-run episode aired in the fall of 1990, after which CBS showed reruns until Reubens’ much-publicized arrest in the fall of 1991 for masturbating in an adult movie theater in Sarasota, Florida. The guardians of the public trust did their damnedest to turn this into a deal, using it as an excuse to submit to the public record that they’d always thought there was something peculiar and unhealthy about that fellow—but in the end, that dog wouldn’t hunt, and the public seemed more interested in finding out how the crime rate in Sarasota had dropped so low that police officers had nothing better to do than trawl dark rooms for public wankers. The Playhouse remains a Lost Horizon for weird kids of all ages. As its creator and holder of the lease, Paul Reubens remains forever bulletproof. Tequila!